Ski Pass limited to the areas of Les Carroz, Morillon, Samoëns, Sixt and the "Combe de Vernant". 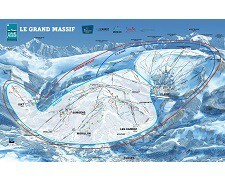 Warning: the Massif ski pass does not include the ski area of Flaine. Access 95 slopes and 43 lifts between 700 and 2200m. * Basis: age of the person on the first day of validity of the lift pass bought. For those aged under 5 and 75+, ski passes are free and only issued in our lift pass sales offices upon presentation of proof of age (no administration fee). Tariffs do not include cost of skicard (+1.60€ per pass) - compulsory regardless of duration. Rechargeable, but non-refundable.